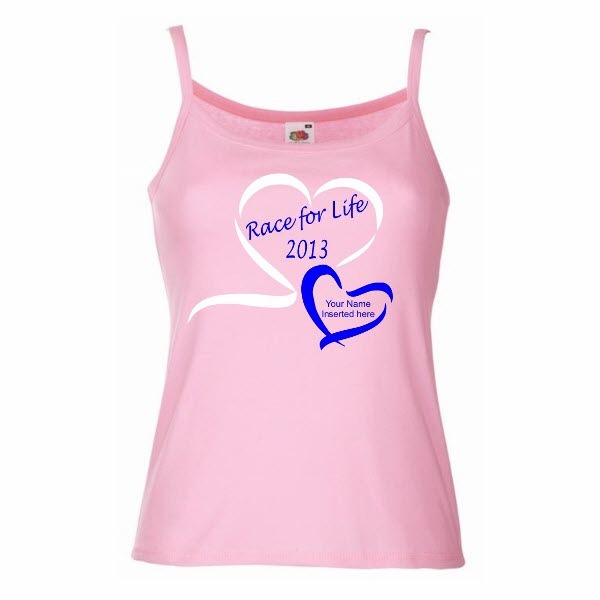 Personalised Race For Life 2013 Strappy Vests. Fruit of the Loom strappy vests, available in Fuchsia, White or Light Pink. 5 sizes to choose from, XS - Size 8, S - Size 10, M - Size 12, Large - Size 14 and XL -Size 16. Personlise this t-shirt with a name within the blue heart. This can be the person you are running for, in Memory Of or you can leave it blank, it's entirely your choice. There is also an option to add text to the back of the t-shirt. For every t-shirt purchased a 10% donation will be made to Cancer Research. Once all of the races have been run we will post on our website the amount raised by our customers. So buy your t-shirt and raise the money for an extremely worthy cause! Thanks to your orders last year we raised over £250 for Cancer Research!